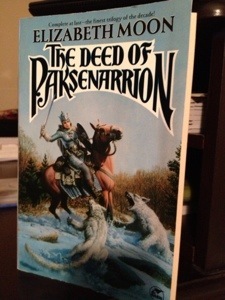 I’ve been reading Oath of Fealty by Elizabeth Moon and I started thinking I might reread The Deed of Paksenarrion again. The copy at the left is the third copy I have owned. Yes, I’ve read it that many times. And yes, I’m ready to read it again. I thought it would be fun to ask you guys if you wanted to join me. If you’ve never read it, you could discover it while we reread. It is a wonderful series. It seems that my timing is perfect, then! I’ve never read Deeds of Paksenarrion. I’m hesitant to commit myself since life’s been kind of topsy-turvy, but I think a book discussion is a brilliant idea. I hope things work out for you. I know what topsy-turvy is like! If these group reads work out, I’ll do them regularly. I don’t own a copy, I don’t think, so I’ll have to see if the library has one. I haven’t read the new book, because I was waiting to reread the older ones. And, of course, I am obsessively writing my own (#2 in the Baba Yaga series for Berkley) so I don’t have a lot of time to read…. I’m not sure if I’d be able to keep up. I’m also writing more than reading, so I expect it to take at least a week to read each book. I’ll just start posting and you can join in and reminisce, or read along–your choice!